Inside of a Dog is where I talk about the books that I am reading and other things related to books and reading going on in my life. Book Beginnings on Friday is now hosted by Rose City Reader. The Friday 56 is hosted at Freda's Voice. Check out the links above for the rules and for the posts of the participants each week. Don’t dig for your favorite book, the coolest, the most intellectual. Use the CLOSEST. A bead of sweat rolled down Deputy Mattie Cobb's face beneath the plastic guard on her helmet. Rainbow intercepted her as she started past the dispatcher's desk, holding out a paper bag. "Here's a sandwich and some fruit for you to eat for lunch on your way up, and there's a bottle of water in there, too." Mattie could see the distress in her face. "Take care of yourself out there. I don't want you to get lost, too." 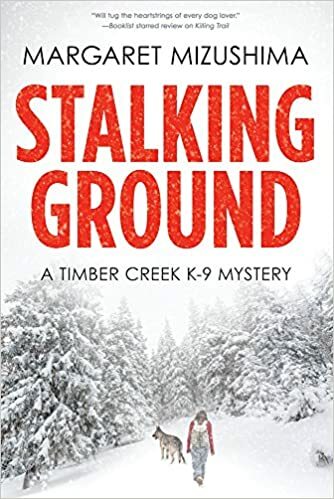 When Deputy Ken Brody's sweetheart goes missing in the mountains outside Timber Creek, Mattie Cobb and her K-9 partner Robo are called to search. But it's mid-October and a dark snow storm is brewing over the high country. And they're already too late. By the time they find her body, the storm has broken and the snow is coming down hard. While Brody hikes down to bring back the forensics team and veterinarian Cole Walker gathers supplies to protect them from the storm, Mattie and Robo find themselves alone, guarding the gravesite overnight in the dead of the early winter. And that's only the first long, dark night in a series of them, because as their investigation develops, Mattie, Robo, Brody, and Cole find themselves in the middle of the killer's stalking ground--where the hunters have just become the hunted. An effortlessly engrossing read filled with tension, excitement, and heart, Stalking Ground, the second in Margaret Mizushima's lauded debut series, will send a chill down every reader's spine. Now this needs to be on my reading list. Loving the sound of it. And that cover is good too! The description of the weather and the cover are chilling--omens of things to come. Enjoy! Ooh, this one sounds intense...and impossible to put down. Thanks for sharing, and for visiting my blog. I want to know where they are going and if they will get lost or not. Thanks for sharing! Oh wow this one is going on my list. Thanks for sharing this hope you enjoy. Have a great weekend. Sorry I got here so late - but this looks like a very good read. Thanks for sharing and for the visit. This blog is now officially declared an Award Free zone! I do appreciate your kindness in thinking of me and I am humbled by your generosity. Your comments are award enough for me. Comment away! If I accept your book for review, I will agree to read, review, and post the review prior to the book's publication date only if I receive the book a minimum of 21 days before the book is published. Books arriving later than that will be reviewed as they fit into my review schedule.